"Greenest" battery backup in its class. New, highly efficient charging system. Master and controlled outlets; "phantom load" elimination. PowerChute® safe system shutdown software. Full data line surge protection. The "greenest" battery back-up in its class, this state-of-the-art device delivers the world’s most reliable computer system and peripheral power protection. Significantly reducing energy consumption, it utilizes a new, proprietary charging system that's five times more efficient than any other in its VA range. Master and controlled outlets eliminate "phantom loads" by cutting power to printers, scanners and speakers when your computer is not in use. Included PowerChute® safe system software smoothly shuts-down your workstation in the event of an extended power outage. 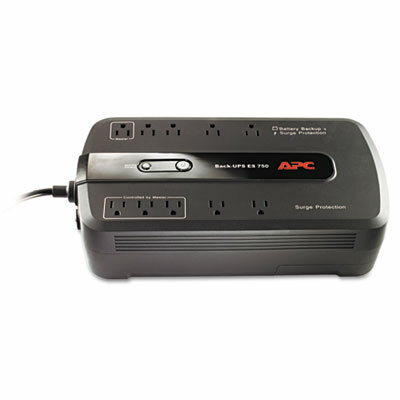 Full data line surge protection ensures that all AC, network, phone and coaxial connected devices survive power spikes. Four stage LED status display indicates: On Line, On Battery, Replace Battery and Building Wiring Fault. Innovative high frequency design results in the optimal use of materials during manufacture. Compact, sleek and modern. Easy battery replacement; no tools required. Disclaimer Statement(s) Run Time based on a load of 225 watts.